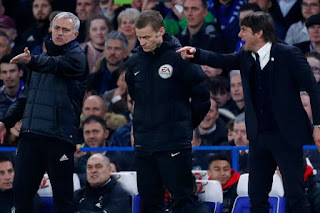 Manchester United fans have mocked Chelsea manager Antonio Conte following the Blues 0-0 draw with Leicester at the Stamford Bridge on Saturday. Chelsea showed up a dismal performance against Leicester and Manchester United fans took to twitter to say that Jose Mourinho’s argument with the Italian has affected him negatively. Mourinho and Antonio Conte have been at each other’s throats. The fans, listing Chelsea’s results so far since the argument began, wondered if Mourinho was inside Conte’s head? LJ wrote, “Since José Mourinho called Antonio Conté a match fixer who celebrates like a clown. Ryan said, “Chelsea’s results since Mourinho entered Conte’s head.